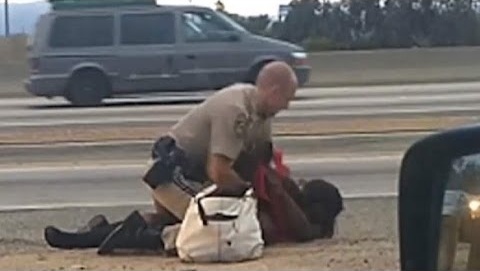 A woman who was punched by a cop will receive $1.5 million from the California Highway Patrol. On July 1, Marlene Pinnock was assaulted by Officer Daniel Andrew. The incident gained national attention when a witness filmed the attack and posted the video online. Prior to the assault, the 51-year-old great-grandmother was walking in traffic on busy freeway. The officer said he approached Pinnock because he was concerned for her safety. Marlene Pinnock said she was in fear for her life. She said it felt like the officer “was trying to kill” her. According to witness reports, the assault lasted for approximately 15 seconds. David Diaz witnessed and filmed the woman being punched by the cop. He said Pinnock had stepped off the shoulder into oncoming traffic. However, she returned to the shoulder before she was approached by the officer. BBC News reports that Marlene Pinnock did not suffer serious injury. However, she was “placed under psychiatric supervision for two weeks.” The woman reportedly suffers with bipolar disorder, and had forgotten to take her medication for several months. As reported by USA Today, CHP commissioner Joe Farrow confirmed Officer Daniel Andrew was immediately placed on administrative leave. However, he later agreed to resign. In addition to the civil lawsuit, Andrew could be charged criminally. Although the California Highway Patrol conducted the investigation, their findings were forwarded to the Los Angeles County Prosecutor’s Office.